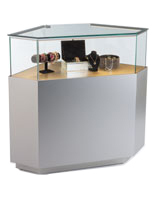 These silver semi-gloss retail cabinets are attractive exhibit cases that can be used in an art gallery, tradeshow, museum, library or other business setting to display presentation items appropriately! 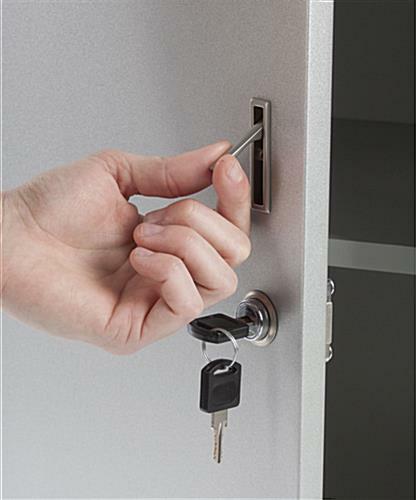 The sliding and locking drawer measures 12"w x 1-3/4"h x 11-1/8"d and can realistically hold spare goods, business cards or company information pamphlets. 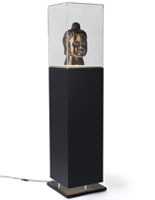 Exhibit cases that can be used to display ancient artifacts in a museum can help to break up a traditional space and add a bit of modern flare to any gallery arrangement. 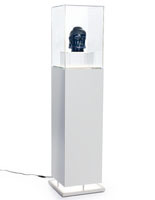 The interior of the pedestal has adequate room for storage, as the dimensions are 14-7/16"w x 41-1/4"h x 13-1/4"d. This space can serve as a place to house photo frames containing additional information, graphics of the item or other display merchandise which can be quickly switched out. Exhibit cases that can be used to display products in the foyer of a business can definitely help to increase sales and visibility of that advertised item! These store fixtures can also be used to create a distinctive booth arrangement for trade show exhibitors. 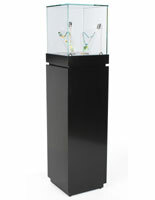 These custom stands, exhibit cases, can be used to creatively accentuate business merchandise at tradeshow conventions! 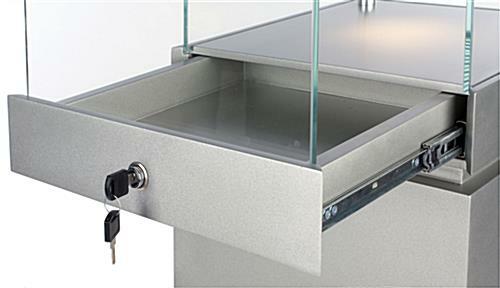 Each tempered glass top measures 14-1/4"w x 15-1/2"h x 14-1/4"d, which has the ability to conveniently hold multiple artifacts. Although not all business-related exhibitions sell merchandise, exhibit cases that can be used to highlight product attributes at a tradeshow can be extremely beneficial to any company. These display stands have two warm LED lights which can be a valuable tool when attempting to drive future sales of a specific product, even at business-to-business conventions. 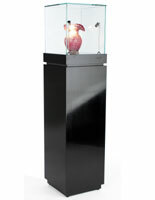 Gallery exhibit cases, like these glass design towers, can be placed in high-traffic areas of a business to show off the stages of a project through a series of graphics or photos! These pedestal stands can be incorporated innovatively into the design of a floor layout of any retail company to enhance the space and provide a custom appearance to the room as well! 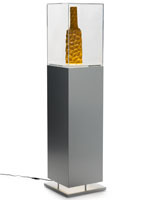 These glass pedestals, exhibit cases are packed well in a custom crate for safe and secure shipping! Each design case ships assembled, thus enabling any user to remove all packing material and begin to use these tradeshow stands immediately!